Five year old Murtaza Ahmadi, an Afghan boy whose photo went viral after he was pictured wearing an Argentine National Team soccer jersey made from a plastic bag with ‘Messi’ and the number ‘10’ penned on the back, has received a special package sent by UNICEF Goodwill Ambassador Lionel Messi. 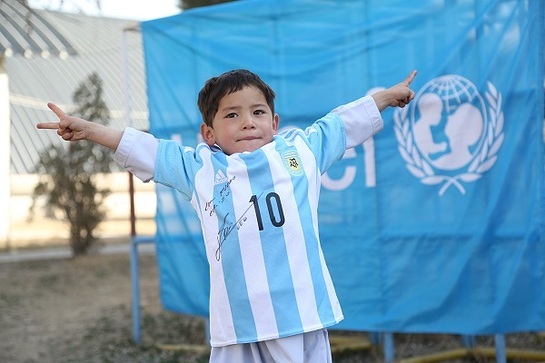 The package, given to Murtaza at the UNICEF Afghanistan Office in Kabul, contained two of Messi’s teams’ soccer jerseys – the Argentine National Team and FC Barcelona – and a ball, to symbolise a child’s right to play. The items were signed by Messi himself.